I thought I had posted some of these a long time ago but I can't seem to find them. I truly hope you took a picture of the frog as the only cameras I own are in my military phone and my Fire.I have no idea how to link pictures to my desk top.I've tried sending them via email to myself but it doesn't seem to work. 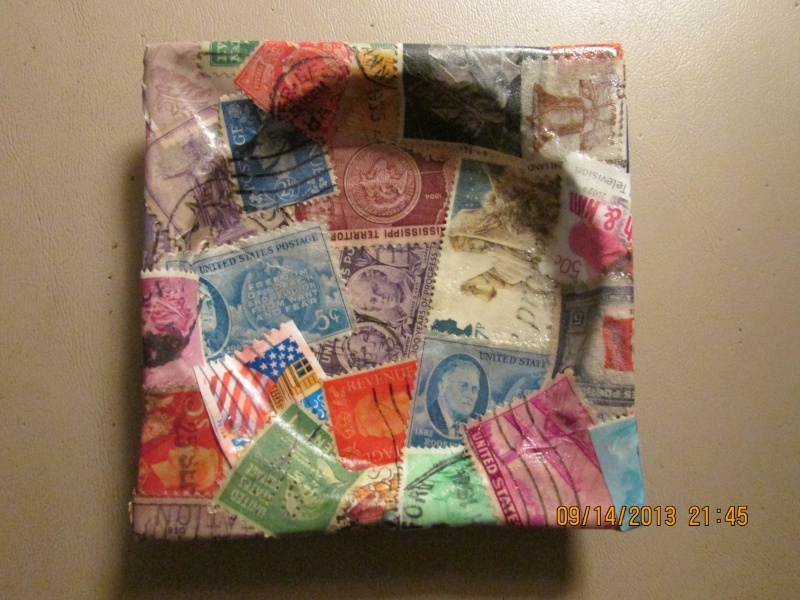 Very nice JanetC, Mya wants me to save her damaged stamps. I already started to but the Egypt stamps are in great condition. What did you use to stick the stamps on, glue stick? crazyquilter, I use regular Elmer's Glue. And I have just started using Mod Podge spray over the top of it to seal it. Works better than what I use on these 2 items. Yeah, ya did! I recognize the ashtray. The rest of that thread page talks about how you started using it as a hinge tray. 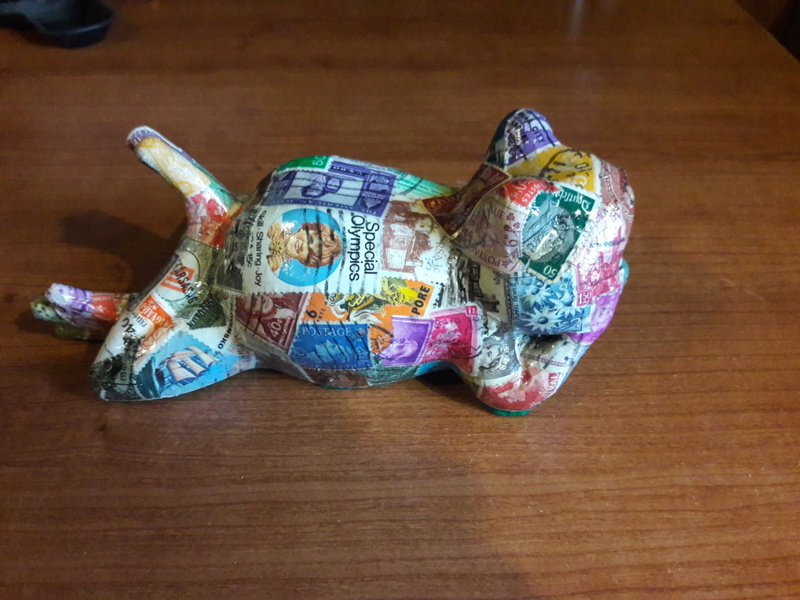 khj , I thought I had posted it on Stamp Bears. If you go by the date on the photo it got lost in the older threads somewhere. Yup, you actually posted it same day. I don't remember the cup, though. I just did that one not too long ago. Got bored and was looking for something to do. 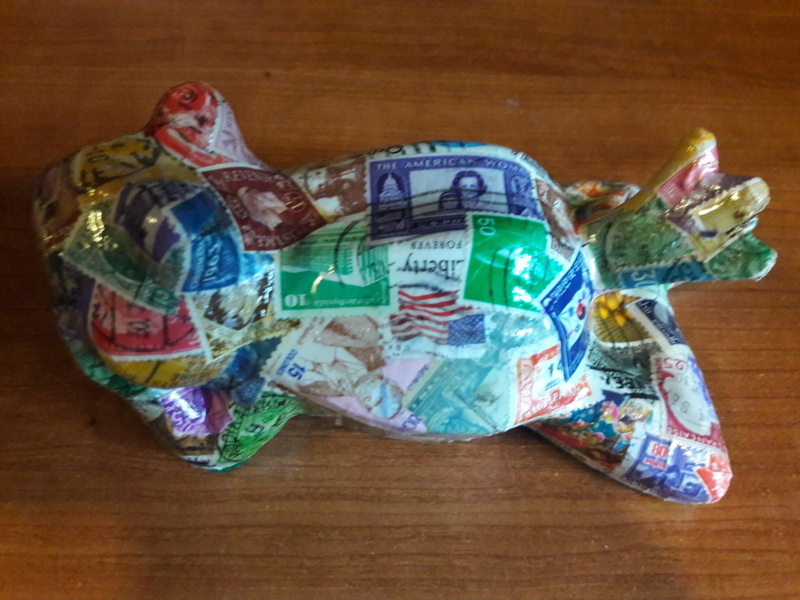 As soon as Frog receives his stamp covered frog (should be Tuesday) I will post pics of that too. I have an old plate that I started covering and am going to hang that one up here in my hobby room. Very nice. If anyone is interested in receiving more damaged stamps please let me know. I have been throwing them in a box hoping someone, someday might want them for some art project. Just let me know and I will gladly send some to you. stampie78, I just love damaged stamps. I will take them off your hands. There are also several groups that accept damaged stamps. They are listed in a thread somewhere on here. Will edit this post if I find the links. stampie78 , I just love damaged stamps. I will take them off your hands. There are also several groups that accept damaged stamps. They are listed in a thread somewhere on here. Will edit this post if I find the links. OK, I will get a few in the mail for you. These are by the way from everywhere and not just USA. The only reason I have them is I am a packrat and throw away nothing. Will try to get them in mail this week. After our coming winter storm tomorrow. That would be second one this week. stampie78, There are several places that are going to get hit tomorrow. Be safe and thank you. If you come across a few more stampie78, I could use them for Mya. 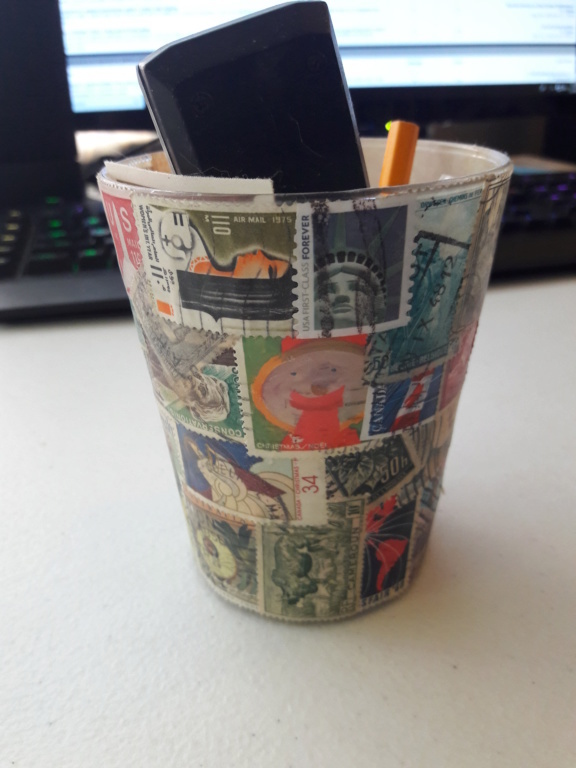 She wants to use a soup can and put old stamps on it. JanetC These look really good. Great job. JanetC, I actually put a bunch of stamps in an envelope yesterday with your name on it.Common stuff that has art value.I'll get them off this week.I'll clean out the table tray and send them too. (they might be worth a look over). If you come across a few more stampie78 , I could use them for Mya. She wants to use a soup can and put old stamps on it. Not a problem. I will have some in the mail for Mya this coming week. Weather permitting of course. Here is my latest piece that was sent to one of our members. I bet you can't guess who.